Your feet are an important part of you. They carry you around for a lifetime, run a marathon, take a stroll at the beach, get you to your desired destination - they help you carry out just about all of your daily activities. In fact, your feet have 4 times more sweat glands than elsewhere on your body; at times they can become sweaty and emanate an unpleasant odour. 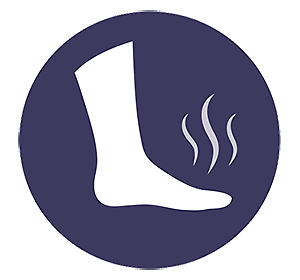 Most foot deodorant sprays mask the odour with artificial fragrances. Instead of just covering the odour, you need a formula that kills the bacteria which causes the odour. Proven to effectively kill odor-causing bacteria. This formula contains Tea Tree oil to neutralize foot odor and Menthol to cool the skin and leave a refreshing scent. Easy to use spray allows for a controlled and targeted application. Footlogix ® is the world’s first and only Pediceutical® foot care line offering innovative products that provide effective and transformational results. Footlogix empowers professionals with the ability to elevate pedicures to a new standard of excellence. Products are easy to use, highly concentrated and cost effective. Footlogix® is committed to ongoing support through superior educational services. The Footlogix home care range provides fast and effective results for continuing use at home. Our unique products are lightweight, non-occlusive and easy to apply- leaving no greasy residue. Through our proprietary Dermal Infusion Technology ® (DIT) active ingredients are carried into all the layers of the epidermis, helping to restore it to a healthy state.